Gravity preaches the following ethics: since things tend to fall till they can fall no longer one should build one’s house on solid ground. But modernity comically undermines this stance by making all that is solid melt into air. Faced with this antagonism, some simply assert restlessness as the new stability But others, flirting with performative paradoxes and dodgy kinds of aesthetic magic, have experimented with intense forms of concentration in the hope of trying to set up house on points of gravity suspended above the normal base: they have wondered about the discipline of only living in the trees (Calvino), of becoming part bird (Mozart), finding inspiration in marionettes (Kleist and Rilke), or only acknowledging the reality of a tightrope (Genet) or trapeze (Wim Wenders). Strategically inserted into the kinds of worlds we live in today, these aesthetic experiments can force us to confront, amongst other things, a number of uncomfortable issues regarding the contemporary limits and potential impotency of the political. So in the name of a certain experimental madness, this presentation seeks to investigate the validity of the theories of those who spurn the ground by putting them into performative practice within the lecture itself. 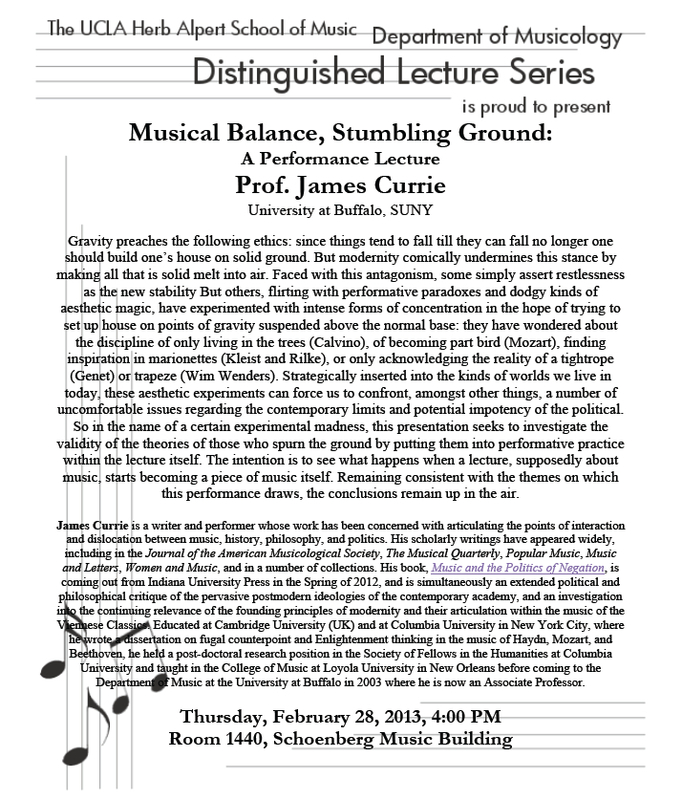 The intention is to see what happens when a lecture, supposedly about music, starts becoming a piece of music itself. Remaining consistent with the themes on which this performance draws, the conclusions remain up in the air. James Currie is a writer and performer whose work has been concerned with articulating the points of interaction and dislocation between music, history, philosophy, and politics. His scholarly writings have appeared widely, including in the Journal of the American Musicological Society, The Musical Quarterly, Popular Music, Music and Letters, Women and Music, and in a number of collections. His book, Music and the Politics of Negation, is coming out from Indiana University Press in the Spring of 2012, and is simultaneously an extended political and philosophical critique of the pervasive postmodern ideologies of the contemporary academy, and an investigation into the continuing relevance of the founding principles of modernity and their articulation within the music of the Viennese Classics. Educated at Cambridge University (UK) and at Columbia University in New York City, where he wrote a dissertation on fugal counterpoint and Enlightenment thinking in the music of Haydn, Mozart, and Beethoven, he held a post-doctoral research position in the Society of Fellows in the Humanities at Columbia University and taught in the College of Music at Loyola University in New Orleans before coming to the Department of Music at the University at Buffalo in 2003 where he is now an Associate Professor.